This is Mike, I was on the boat on Memorial Day with Frank & Dotty. Just wanted to say thank you for a great day of fishing and that I had a blast. I'm working on getting a group together for a charter. If you ever need a deck hand, I would be more than happy to help you out. Thanks so much for your time yesterday, you went way above and beyond teaching my boys (and me) about fishing in this area and about the area in general. I appreciate your patience and efforts. The boys had a fantastic time and cannot wait to do it again later this summer. I'm sorry it took so long for me to drop you a line, but I had to thank you for the great trip we had last August. My son has not stopped talking about the trip. I must say, you are definitely the hardest working Captain I have ever met. From the get go, you busted your back to be sure we had a great trip. 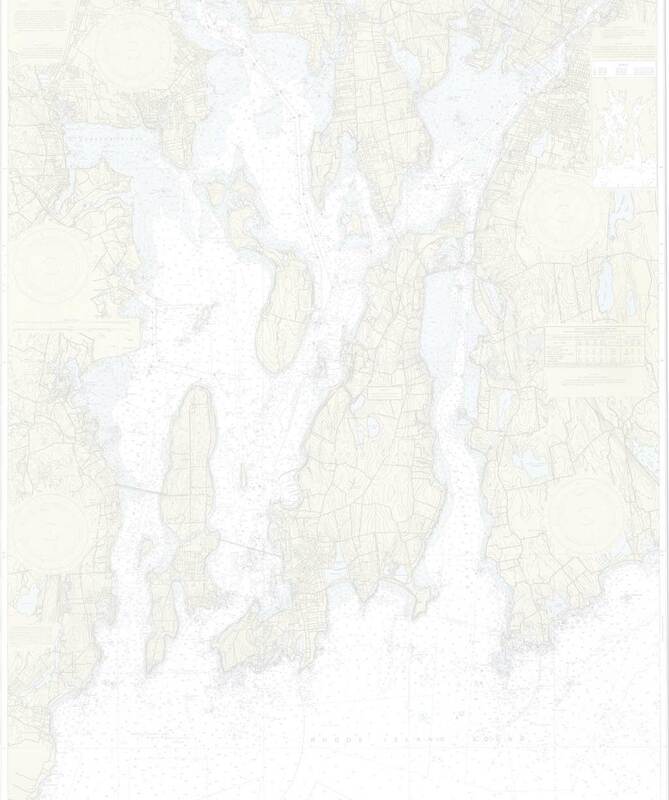 The fact that you let my son steer the boat from Block Island back to your mooring is something that he brags on to this day. We will definitely be going out again soon, so thanks and get ready. Thank you both so much for making our vacation more memorable. It was fun and educational without knowing it. That's the best education to get. Everyone we show the pictures are amazed at the size of the fish and that we caught so many. It was truly the highlight of our vacation. My middle son Devin said he had a great time too but was disappointed that he was the only one that didn't catch anything. So we may have to go again. Again thank you so much for the memories. Best to you all and your families. Just dropping you a note to say thanks! 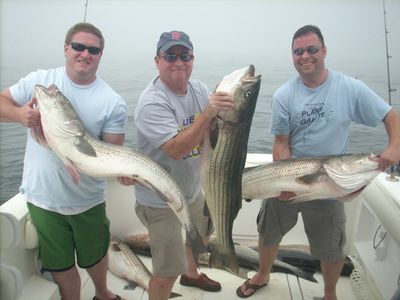 My dad, my brother-in-law (Brad) and I had a blast fishing with you and Chad last week! 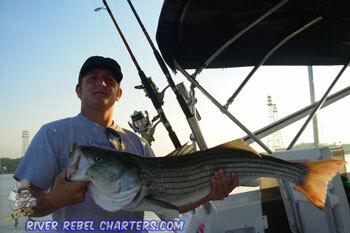 Those were the biggest striped bass we've ever caught...great day all around. If you are ever looking to fill a spot (or two) on a charter let me know (except when you're taking out the Koreans)...or if you're ever looking for an extra set of hands on a commercial trip I have no problem getting my hands dirty and helping out. Thanks for a great day of fishing! I have been on several trips in FL and MS off the coast (they use cane poles too, but professional ones. Ha ha) and I can certainly say that this was the best trip ever. 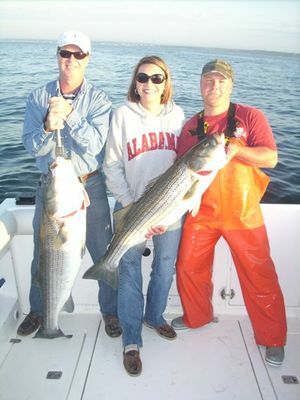 Catching the fish was great, but you and Joe made the trip much better by your friendliness and also by giving us a True look and the state of Rhode Island. Thanks for taking the extra time to show us around. You have a 1st class operation and we both look forward to doing it again soon. I had a BLAST during today's trip! Although it has been 8 years since my last excursion on water and the weather when we started wasn't the best, I still had fun during the early hours. When I reeled in the first fish, the adrenaline and excitement was unbelievable! I didn't realize how fast the time went until we headed back to the dock, I didn't want it to end. I am now trying to talk my kids into taking a trip out with you!! Oh yeah, Al had a good time too!! I talked to my son Ryan Johnson today. He said he has an opportunity to go fishing with you again. I told him you lucky stiff!!! I wish I was going with! Our fishing season is started here again. After our "long" winter. They have been catching Walleyes at Devils Lake 8-10 ponders. I know it is not a 40# Bass but, oh well. some fish is better than no fish. I wanted to thank you again for a great outing (a little late) Even if the guide drops our fillet over board?????? ha ha (I had to through that in you know. ) I could see that you felt worse than we did when that happened. Hope to see you again and go out with you. You are a great guide and it is always a fun trip on your boat. PS I still tell the story about catching a blue fish. People around here can't imagine such a vicious little fish. Have a great fishing season!!!! 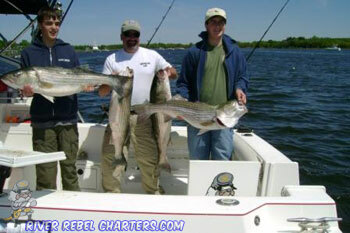 Sat we went out with River Rebel Charters to Martha's Vineyard. 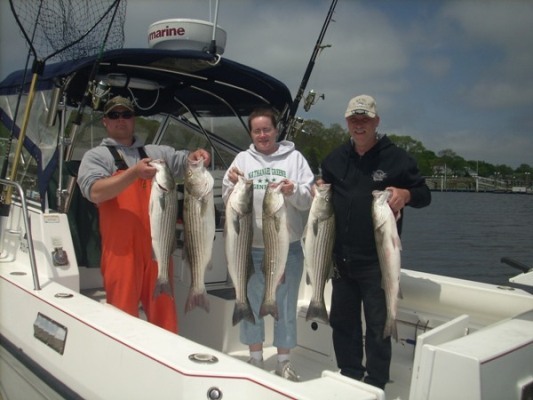 I highly recommend you to go out with Randy and Joe if you are thinking about doing a charter, they are very professional, have excellent equipment, a beautiful boat, and most of all their attitudes are great. Most of the time you get the first 3 qualities and have to deal with ! !#&%$#$ yelling at you all day, but Randy and Joe are definitely not like that. My father and I could not say enough nice things about our trip. It was truly an amazing experience and we are talking about a possible fluke trip later this summer. The service was fantastic and it was nice to have a Capt that we could talk to you and be friendly with. Again, thank you very much and I hope to see you folks again soon. For those of you who don't own a boat I would suggest getting out with Captain's Randy and Joe aboard the River Rebel Charters. What a great time I had fishing with them this past Saturday and they will put you on some fish here are a few pictures of the trip and now's the time to get out there the are some BIGUNS out there waiting for you. Thanks a lot, you guys are great. I will def. refer you to everyone. and once again thanks. Great trip today. Everyone had a great time. What a beautiful morning! 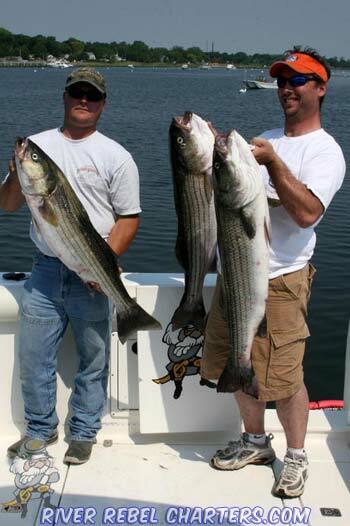 It was lots of fun watching my boys land their first 20 lb stripers. Too bad Elizabeth couldn't land one but she certainly "fought" a couple. Turns out that not only is your boat family friendly but you and Joe are as well. I really appreciate the low key attitude and willingness to look out for and help young anglers. And you guys now how to catch fish! I'd unreservedly recommend you to anyone wanting a great day on the water. Hope to get out there with you again. I spent the day fishing yesterday with Captain Randell Bagwell my two boys and my buddy and his children. The bite was not what it could have been which to Randell just meant he needed to work harder and use every trick he had in his book. Randell felt the extra pressure because he wanted the kids to do well and enjoy themselves. Our children range in age 10 to 14. They all caught fish. Over the coarse of the day we landed a few bluefish, some flounder, and a scup. The morning started with drifting some live eels trying to land some stripers, however the blue fish had other ideas. After about an hour of this one of our boys was getting a little green so we headed into Mackerel Cove and did some fluking. We tried a few of Rendell's honey holes for fluke and in between spots we trolled with plugs, tube and worms and umbrella rigs. We all know that every day on the ocean is different from the one prior. Randell really cares about his clients. Every kid had a smile on their face. Our boys even had the opportunity to drive the boat. 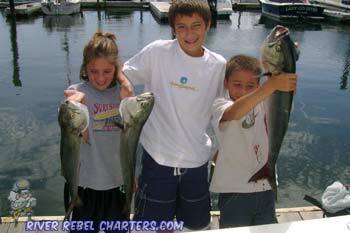 I have used many different charters in the past. I happen too have read Rendell's past post on RIHunts.com and I thought it would be good to meet him and give his service a try. I would recommend any of you to give Randell a call if you are thinking of using a charter service. Randell could not have been more accommodating and he will cater to your needs. Randell was bound and determined to get us into some keeper fish. He then headed over to a third spot and got into them, the action was non-stop!! 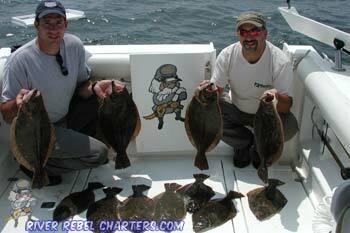 Before we knew it we had our limit of fluke! On our way back in, Joe filleted and bagged up all the fluke and threw them on ice. This was an excellent trip and the first of many. Captain Randell runs a fist class operation!